Rheumatoid arthritis is a chronic autoimmune disease affecting about 1.5 million Americans with three times as many women being affected than men. Women often get diagnosed between ages 30 and 60 while men tend to be older when diagnosed. With RA, the body’s immune system attacks the joints of the hands, feet, wrists, elbows, knees and ankles, causing inflammation and resulting in swelling and pain. Over time, it can damage cartilage, causing joints to become unstable, loose, painful and deformed. The high levels of inflammation associated with RA not only affect the joints but also can contribute to blood vessel damage leading to heart disease. A Mayo Clinic study found that people with RA have twice the risk of heart disease than the general population. In fact, people with RA have a 60 percent increased risk of a heart attack within one to four years after diagnosis. The combined risk of joint and cardiac problems related to RA make it extremely important to follow an anti-inflammatory diet to reduce inflammation and the health issues associated with it. 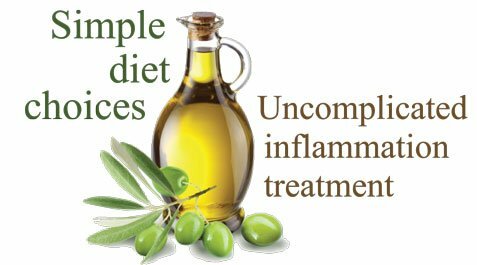 Following an anti-inflammatory diet can be one of the best ways to treat RA, along with the extra bonus of reducing cardiac complications. The good news is this is a great way to eat for anyone, regardless of whether they have RA or not. This way of eating is very similar to the Mediterranean-style diet, well-known for its health promoting properties. Foods commonly a part of the Mediterranean diet are rich in omega-3 fatty acids, antioxidants and phytochemicals, all which boost the body’s supply of powerful anti-inflammatory fighting capabilities. Reducing inflammation to ease arthritis symptoms. Lessening risk of heart disease. Weight control or reduction which helps curb joint pain. Fish – Rich in omega-3 fatty acids, fish is one of the best ways to fight inflammation and heart disease. Choose from among the following – Salmon, tuna, anchovies, herring, mackerel and trout. Fish will provide about one gram of omega-3 fatty acids in a 3 1/2 ounce serving. If you don’t care much for fish consult with your physician about taking a fish oil supplement. Consuming fish helps reduce C-reactive protein (CRP) and interleukin-6 both of which are inflammatory proteins in the body. It is recommended to consume 3 to 4 ounces of fish twice a week. Fruits and vegetables – The more colorful the produce the more antioxidants they have. Choose dark greens such as spinach, kale and broccoli, reds such as cherries, raspberries, and strawberries, blues/purples such as blueberries and blackberries and orange/yellow such as oranges and grapefruit. Choosing more of these types of fruits and veggies means you take in more of the antioxidant anthocyanin, vitamins C and K, all of which prevent inflammation and maintain more healthy joints. Fruits and vegetables are naturally low in fat and high in fiber, all good news for reducing LDL (bad) cholesterol and increasing HDL (good) cholesterol. Aim for 9 or more servings daily. Olive oil – This heart-healthy monounsaturated fat is a must for all kitchens. It contains the compound oleocanthal that inhibits activity of COX enzymes, helping to slow the inflammatory process and sensitivity to pain. Its monounsaturated fatty acid content can help lower cholesterol and may normalize blood clotting. Extra virgin olive is recommended – it is from the first pressing of the olives and is considered to have the best freshness and flavor. Olive oil can be used numerous ways, such as for sautéing vegetables, mixed into salad dressings and sauces, drizzled over cooked pasta or vegetables, or used in place of butter for dipping bread. Two to three tablespoons daily is recommended. Beans – Also known as legumes, this inexpensive source of protein, fiber, zinc and iron should be a mainstay in every home. All beans can be part of a healthy diet that includes red, pinto, black, garbanzo, kidney and lentils. Beans are particularly rich in soluble fiber, helping to reduce the bad LDL cholesterol. They contain no cholesterol, saturated or trans fats, so are very heart-healthy. Beans also contain phytonutrients that function as anti-inflammatory compounds, helping to lower CRP, an inflammatory protein. Serve up 2 or more cups a week. Nuts and seeds – It seems like nuts and seeds can be valuable gems in fighting inflammation and heart disease. A 2011 study found people who consumed nuts had a 51 percent lower risk of inflammatory diseases such as RA. Both nuts and seeds contain monounsaturated fat and are loaded with vitamin B6, both which help reduce inflammation and are good for your heart. Due to their high fat and calorie content, a handful each day is all you need to get the health benefits nuts and seeds have to offer. Best sources for fighting inflammation include walnuts, pistachios, almonds, cashews, pine nuts, sunflower seeds and pumpkin seeds. Green tea – Live like the British do and have that afternoon cup of tea – or more frequently throughout the day. A study funded by the National Institutes of Health found that green tea had curtailed the inflammatory substance cytokine IL-17 while increasing the anti-inflammatory substance cytokine IL-10, leading to reduction in severity of arthritis. In addition, antioxidants in green tea can block the production of molecules causing joint damage associated with RA. Green tea drinkers may also decrease their risk of heart disease – a study of Japanese adults found that drinking five or more cups of green tea a day lowered death from heart attack or stroke by 26 percent as compared to those who drank less than one cup a day. Living with rheumatoid arthritis can be difficult enough due to pain and inflammation. Eating a healthy, Mediterranean-style, well-balanced diet can be one way to possibly help reduce RA symptoms and heart disease. “Eating anti-inflammatory foods (some of my favorites are almonds, blueberries, kale and sweet potatoes) is a great way to alleviate some of the pain that comes along with rheumatoid arthritis. Try it,” Dr. Samadi reiterated. Like with any chronic disease, always consult with your physician on diet and medications. Image: Academy of Nutrition and Dietetics. Cheryl Mussatto MS, RD, LD, is a registered dietitian and an adjunct professor at Allen Community College, Burlingame, where she teaches Basic Nutrition, and at Butler County Community College, Council Grove, where she teaches Therapeutic Nutrition. She is also a certified health and wellness coach. She writes Eat Well to Be Well, a column about health and nutrition, is also a blog contributor for Dr. David Samadi at www.samadimd.com. Contact her at [email protected] or visit her website www.eatwell2bewellrd.com.